Our 9th-12th graders are invited to join Senior High Fellowship led by lay youth leaders. The group meets Sundays in Riley Hall from 6:30-8:30 pm. Feel free to bring friends from outside our church. Our 7th and 8th graders attend a Bible and Faith Formation Class, Our goal is to provide a fun and engaging experience for this wonderful group of kids and prepare them for Confirmation in the 9th grade. The group meets every Sunday. Our 6th, 7th and 8th graders also attend Junior High Fellowship led by lay leaders. The group meets every other Sunday in Riley Hall from 4-5:30 pm. We offer Confirmation to the high school members of our community of faith starting in 9th grade. Confirmation is not about teaching dogma or doctrine. It is not about passing on information. Confirmation is about exploring our spirituality. It is about hearing the stories of people who have struggled with faith and found wisdom and insight along the way. It is about learning from other people’s relationship with Jesus. Confirmation is about making choices and asking questions and challenging presumptions and touching the heart of God. 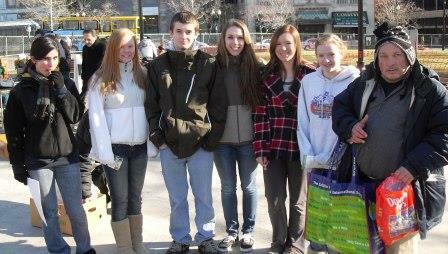 Pictured is confirmation students and a member of the Common Cathedral congregation as they worshipped outside at the Boston Common. Every summer our senior high youth and adults go on mission trips working to repair homes and provide hands on ministry and care. They have done mission as far away as Chicago and as close as New Jersey. 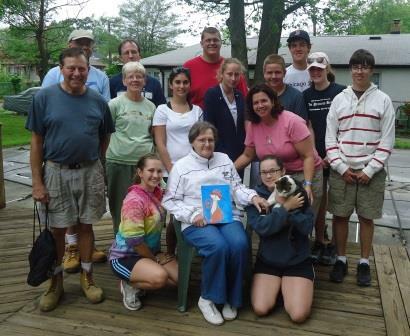 Pictured above is youth and adult leaders with a homeowner the group helped when her home was flooded during Hurricane Sandy. We also sponsor adult only mission trips. Click below to see the mission trip videos. The one on Chicago is the shortest one. Take a peek!